"If ever there was a New Year to celebrate this is it! The year 2011 is both the end and the beginning of the greatest period in all of human history." As the year 2010 comes to a close (thankfully), we are sitting at the dawn of a grand new age for humanity. An age of incredible beauty, massive evolution and deeply profound significance. Life as we have come to know it is about to dramatically change… for the better, beginning in the year 2011. If ever there was a New Year to celebrate this is it! The year 2011 is both the end and the beginning of the greatest period in all of human history. We are literally leaving behind an old way of being and moving into something far greater and far grander for the entirety of the human race. As a matter of fact, 2011 promises to be perhaps the most extra-ordinary, the most amazing year ever in the entire history of planet Earth before we even reach 2012. That's right, EVER! The Earth and the human race have been on a steady yet carefully managed evolutionary path for a long, long time. It has been a 16.4 billion year journey that is about to come to a conclusion in 2011. A 16.4 billion year time frame is a nearly unfathomable number to comprehend for the feeble human conscious mind yet here we are. At the end of the line. We know this to be true because we can plot out the historical record and clearly see that human evolution has been accelerating through various distinct stages or cycles. And now we are about to reach the pinnacle of evolution within this third dimensional reality in which the Earth dwells. So that means we have arrived at point where a great shift must take place simply because a change has become absolutely necessary. In other words, we have evolved as far as we can within our third dimensional experience and we now must graduate (or ascend) to another level of existence. This evolutionary path that we have been on can be summarized in one word –– consciousness. The flow of consciousness can be precisely measured and it tells us that we have reached the final hour. We are now evolving at such an ever increasing rate that we are poised to shift into the highest level there has ever been on this planet. Have you been feeling that your life is moving very quickly, maybe even faster than you able to keep up with? That is accelerating consciousness evolution that you are feeling. According to one of the twenty different Mayan calendars, specifically the one known as the Tun calendar, we are sitting on the cusp of the 9th and final level of consciousness that will commence around early February or March of 2011. This 9th level of consciousness will then conclude on the date of October 28, 2011. That means that as much evolution that has occurred over the last 16.4 billion years will unfold over those 230 to 260 days from February to October! Also, the amount of change that used to take a year's time will now unfold every 18-20 days! That is twenty times faster than the previous cycle. 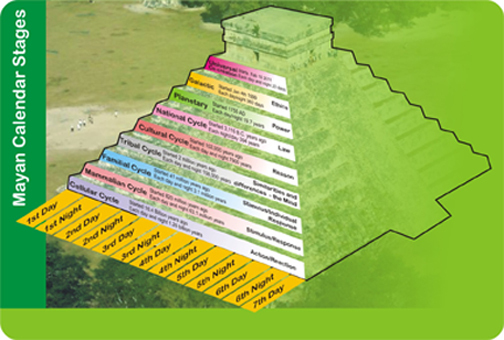 All of these cycles and dates were deciphered by Dr. Carl Johan Calleman, a Swedish microbiologist and author of several Mayan calendar books. 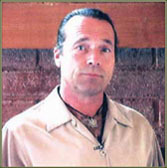 His research was further advanced by author, Barbara Hand Clow and Mayan calendar investigator, the late Ian Xel Lungold. Why nine levels? The number "9", of course, is very significant within numerology as it is symbolic for completion. This is why many of the pyramids built by the Mayans and later discovered in the jungles of Mexico and Central America contain nine levels or steps to their structures. The Mayans knew more about time, consciousness and evolution than our any of our scientists or our religious leaders do today. They were one of the most extraordinary peoples to have ever lived upon the Earth. Incredibly, they figured out that we would complete this evolutionary cycle in the year 2011! The Mayans tell us after we conclude this final and 9th stage, we will enter into a period known as "the time of no time." Or in other words, the end of the third dimensional world as we have known it. For time is both an illusion and a prison, that has trapped us within this 3-D existence. But all of this will begin to transform in the coming years. In essence, we have nearly completed the human experience and are now ready to move onto to something much greater –– the 5th dimension and a transition to a new Earth! Can you see how exciting these times are? Yes indeed, the future looks very, very bright for all of us! The Earth has been perhaps the most challenging planet in all of the universe to live upon. The energy is so heavy and ponderous that it has been nearly impossible to know our way around. It is as if we have been fumbling in the dark, not having a clue how to survive. This is why the human race appears to be in such an overwhelming crisis at this time. But now, with this great shift of consciousness, it will seem as if we are moving from mostly a dark, black and white world to one transformed into full blown, glorious technicolor. Can you imagine how exciting that will be? 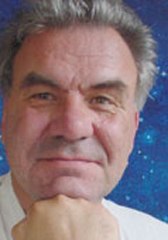 This 9th and final consciousness level that we are entering in 2011 has been termed the "consciousness of co-creation". The year 2011 has also been declared "the Age of Miracles". I think you will agree, that sounds very promising indeed. This is truly the time where life becomes infinitely more phenomenal. In the consciousness of co-creation we are going to discover the true power of our thoughts, feelings, attitudes and beliefs than ever before. 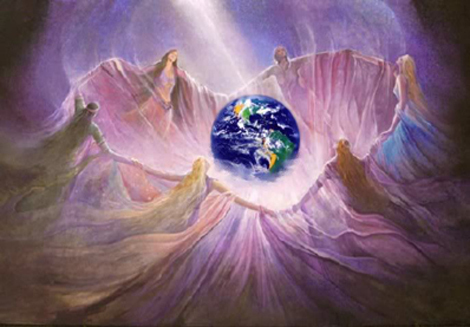 Due to the fact that the consciousness of the planet will now be cooperating with us instead of hindering us. Now will these changes be announced in the New York Times or be reported by CNN? Hardly. Will our government or world leaders tell us all about the real significance of these times? Don't bet on it. Will our religious leaders help guide us through these tumultuous times upon the Earth? Highly unlikely. And finally, will everyone even be aware that something this dramatic is happening on planet Earth? In a word, no. Realize that this will be very much an individual experience. What you will be experiencing and what your next door neighbor will be experiencing could perhaps be entirely different –– depending on where your thoughts, feelings, beliefs and attitudes lie. But, if you tune into these rapidly evolving energies and frequencies that are now pouring into the planet you will feel them. However, it is important that you allow yourself to let go of the fear and anxiety that always arises when humans are faced with great changes –– and these will be the greatest changes of all. Instead, focus on the positive and have faith you will be guided through this temporarily bumpy transition by a gentle Divine hand as we venture our way onto the new Earth. If you can accomplish this, then you will notice the world around you is moving much more rapidly than ever before and your own life will begin to improve as well. 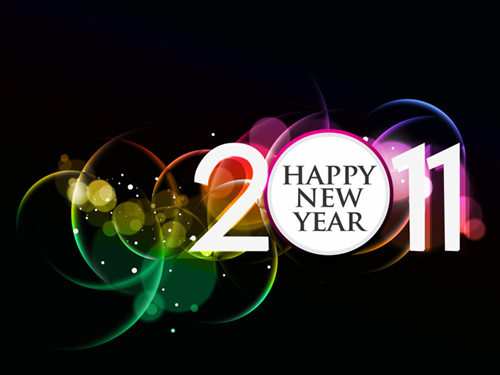 As this Earthly human experience becomes sweeter and sweeter moving into the years 2012, 2013, 2014 and beyond. This is not to suggest that these changes will happen in the blink of an eye or happen overnight. Or to promise that everything will be smooth sailing. Life will not suddenly be perfectly rosy on October 29, 2011 nor anytime in 2011 necessarily. Rather, this is just the beginning of the unfoldment. For those who are ready, who have opened their hearts, they may experience very rapid transformations in their lives that will take them into awakened or enlightened states of consciousness. For others it may take more time to achieve these states. The bottom line, it is all up to you. However, within the next couple of decades all human suffering, problems and conflicts will completely disappear. All violence, war, strife, oppression, poverty, injustice, lack, limitation and every other negative human condition will vanish. And all karma will be wiped clean. Forever! We will learn to overcome all illnesses, diseases, physical ailments and even death itself. Yes, you will not have to suffer through dying anymore. As Shakespeare once wrote: "And Death once dead, there's no more dying then." Great wisdom and teachings will emerge. Great technologies long suppressed will come out of hiding. Amazing miracles will be openly visible on an everyday basis. We will get to experience what true, unconditional love is and it will be the most sublime, most glorious feeling you have ever felt. Guaranteed! And after an interminably long period of separation, we will be reunited with those who live among the stars in one of the greatest, most wonderful family reunions for the ages. And best of all, the human race will finally come together as one where we finally achieve the long awaited Heaven on Earth, 1,000 Years of Peace –– upon the new Earth! Then we will come to the realization that our long, long journey has been all worth it. In summation, these are the times we had all hoped we would live to see. The times when the greatest events ever would unfold and we would finally begin to witness the Golden Age unfurl before our very eyes. Those times are here now but again, we are only at the beginning stages of this transformation. But we are in the home stretch of the evolution of consciousness as we return to where we started from –– living our lives connected to the Divine and God, instead of separate from –– now moving very, very rapidly towards the finish line. Remember, as one era of the human experience comes to a closure, a whole new more glorious world is opening up right behind it. No matter what you will see on the news or read in the headlines, be grateful you are here and now to participate in these absolutely incredible times. Like no other we have ever witnessed before. So go ahead, pop those champagne bottles and pour out that bubbly. The Golden Age is about to begin. Let the celebrations begin. Patricia Cota-Robles: Author of H.O.M.E. GEORGE HARRISON – "Give Me Love (Give Me Peace on Earth)"